* Quick construction of a surface representing the stormwater pond given the pond depth, side slope and a polyline that represents the top of the pond (high water level). This surface can be built considering a slope change in the sides of the pond. 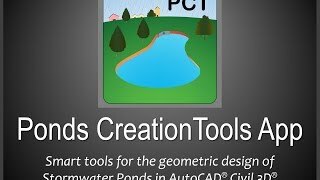 *Automatically calculate the capacity of the constructed stormwater pond. *Generate an elevation vs. storage and depth vs. storage tables for the stormwater pond. This can be used to obtain the accumulated storage capacity at different depths and calculate live storage above the permanent pool in wet ponds. *Export the elevation vs. storage and depth vs. storage tables to a spreadsheet file. Create a plot chart of these tables and copy them to the clipboard. *Create and export a depth-area curve to be used in drainage modeling software such as Autodesk® Storm and Sanitary Analysis, SWMM or PCSWMM.